As I was attempting to photograph a great blue heron hunting for fish I hear a large slap on the water. 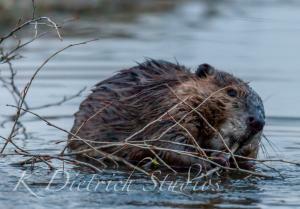 As I turned towards the noise I see two beavers, one adult and one juvenile. I was fortunate to watch them until dark getting a few shots before the light ran out.